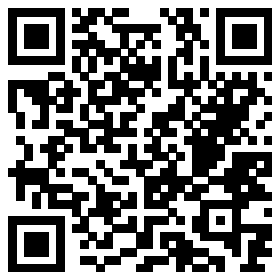 *Scan QR code to download the app. Mobile Assistant Software Requirements: iOS version 6.1 or above/ Android system version 4.3 or above with bluetooth 4.0 support. 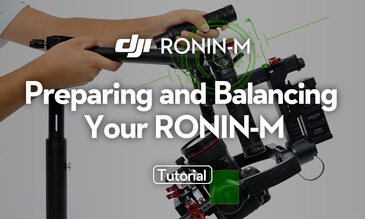 1.What is the main difference between the Ronin-M and the original Ronin? The Ronin-M is much lighter, more compact, easier to transport, and offers the ability to shoot in a wider variety of shooting scenarios when space and flexibility are key. Perfect for aspiring and professional filmmakers, the Ronin-M makes DJI’s world-class stabilization technology accessible to a wider range of creators.While the original Ronin is still suitable for those who require maximum carrying capacity for full setups that would include very heavy cameras, large lenses, and other professional tools to be used together, the Ronin-M is powerful enough to hold and stabilize setups for most shooting situations. 2.What is the Ronin-M for? 4.How much does the Ronin-M weigh? 5.Why does the Ronin-M weigh only 5 lbs? 6.How much weight can the Ronin-M hold? 7.What is Ronin-M made of? 8.What kind of cameras does the Ronin-M support? 9.What is the controllable range of the Ronin-M? 11.How do I remove the handlebars individually? Why would I want to do this? 12.Is it difficult to balance and start using? 13.Does the Ronin-M come with a carrying case? 14.Does the Ronin-M come with a remote control? 15.Does the Ronin-M come with a stand? 16.How long can the Ronin-M operate with a fully charged battery? With the old 3400mAh 4S smart battery fully charged, the Ronin-M can run for over 6 hours, depending on the attached camera rig and gimbal usage.With the new 1580mAh 4S smart battery fully charged, the Ronin-M can run for over 3 hours, depending on the attached camera rig and gimbal usage. 17.How many batteries are included with the Ronin-M? The Ronin-M includes two batteries.The Ronin-M you bought earlier includes one battery. 18.Can the original Ronin battery be used with the Ronin-M or vice versa? 19.Is the Ronin-M battery the same as those for the Phantom 2/3 series aircraft? 20.Can I use the Phantom 2/3 series charger to charge the Ronin-M battery? 21.What is the control range of the Ronin-M remote control? 22.Do I need any special instructions or tools to assemble the Ronin-M? 23.What is the Ronin-M mobile app used for? 24.How can I download the Ronin-M app and which operating systems are supported? 25.Is the Ronin-M remote control the same as those for the Phantom? 27.Can I mount the Ronin-M onto a multirotor/flying platform? 1.Can insufficient motor power cause the Ronin-M to vibrate? 2.What should I do if the temperature of one of the motors of the Ronin-M is very high? 3.What should I do if videos captured are shaky and not properly stabilized? 4.Does DJI offer a dedicated backpack or transportation solution for the Ronin-M? 5.Why is there noise and vibrations coming from the gimbal during the Auto Tune Stability calibration? 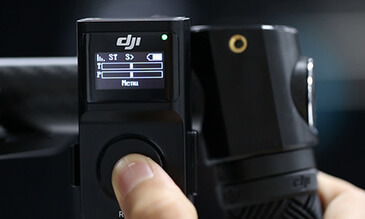 6.Why is the real-time data returned by the Ronin-M abnormal while connected to the DJI Ronin-M Assistant software? 7.When do I need to use Auto Tune Stability to calibrate the Ronin-M? 8.How do I connect the Ronin-M to the DJI Assistant app for Android and iOS? 9.What is the default password for the Ronin-M in the DJI Assistant app? 10.Why does my Ronin-M not follow the movement of the roll-axis after I select roll-axis SmoothTrack? 11.Can I use third party remote control to control the Ronin-M? 12.Is the Ronin-M difficult to operate? 13.Does the Ronin-M support firmware updates? How is it updated? 14.What is Single Axis Follow Mode? 15.How can I use the Ronin-M with the DJI Lightbridge? 16.How many operation modes does the Ronin-M have and how do I switch between the modes? There are three different modes of operation. These allow the Ronin-M to be used in different scenarios. They are Upright mode, Underslung mode, and Briefcase mode.The default operation mode is Underslung mode.To switch to Upright mode from Underslung mode, turn the Ronin-M so the front faces toward you. 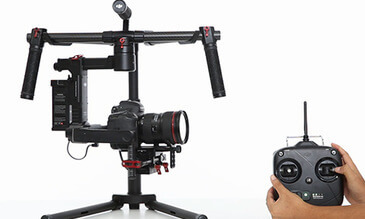 Flip the gimbal over to bring the camera closer to eye level for a higher perspective.To switch to Briefcase mode from Underslung mode, turn the handlebar 90 degrees from the gimbal, then swing the handlebar downward until the mode automatically changes. Briefcase mode must be activated in the Assistant app. 17.How can one operator use the Ronin-M? 18.Do I need any tools to setup and balance the Ronin-M? 19.How can I install follow focus systems or other powered accessories on the Ronin-M? 20.How many times can the Ronin-M battery be used? 21.How long does it take to fully charge the battery? The old battery needs approximately 60 minutes.The new battery needs around 70 minutes. 22.Can the Ronin-M provide power for other equipment or cameras? 23.How long is the Ronin-M Warranty? 24.What is the fastest way to setup the Ronin? 25.What is the difference between the new battery and the old one? The new 1580mAh battery weights 196g and can run for 3 hours. The Ronin-M is equipped with 2 new batteries.The old 3400mAh battery weights 330g and can run for 6 hours. The Ronin-M is equipped with 1 old battery. 26.Is it ok to charge the new battery with the old charger or the old battery with the new charger? 27.Can I use the new battery for the Ronin-M which I bought earlier?